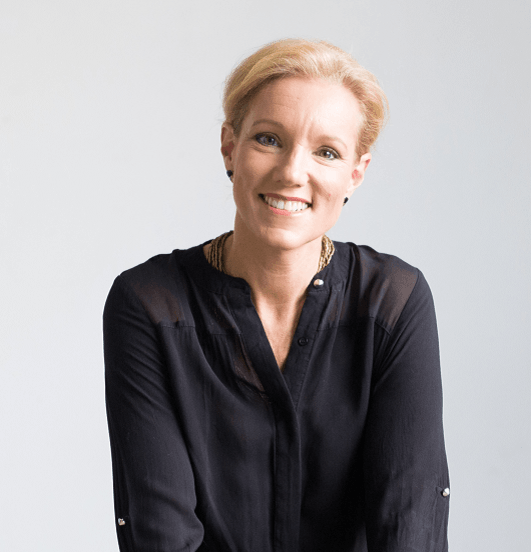 Dr in the House highlights Niccie Kliegl from Fulfill Your Legacy in another five-minute interview on stress in this busy world, and what we can do about it. She encourages listeners to remove THEMSELVES from the pressures of the world and by tuning INTO God. Niccie always closes the show is a nudge “Niccie’s Nudge” for this week is to FAITH INFUSE using the acronym L.I.F.E. L=Lord (step into the Lord) I= take YOU out of the picute and remember that the ‘I AM’ is God (your stressors aren’t yours alone if you are partnered with God) F=Forsakes. The world forsakes- do you want to relay on the world? (That’ll stress anyone out) Rely on God who can be trusted and is all powerful. That will help bring peace. E=Eternally. See the big picture. 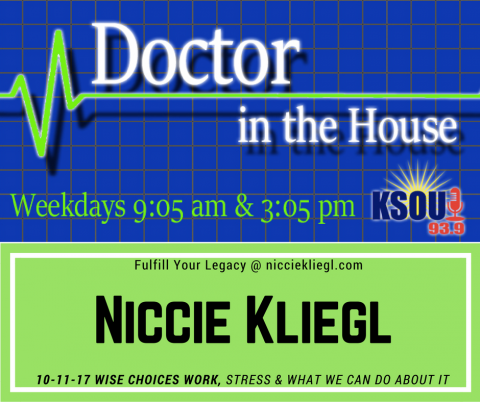 Dr in the House highlights Niccie Kliegl from Fulfill Your Legacy in a five-minute interview on self-confidence. 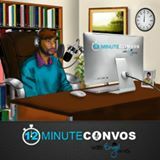 She encourages listeners to understand that most all of us at some point battle with some self-esteem issues. She elaborates on why, what we can do about it, how it will help if we do, and last a reminder of it being our choice to act or not. Niccie always closes the show is a nudge “Niccie’s Nudge” for the week is to FAITH INFUSE: get your mind space filled with goodness and light. What a fabulous time this brief interview, with the passionate Engel Jones, was. He got more out of me in 12 minutes than many can, in a whole afternoon. It was all my pleasure. And a delightful way to give the world a quick look at who I am and what I love to do. Thank You Engel! 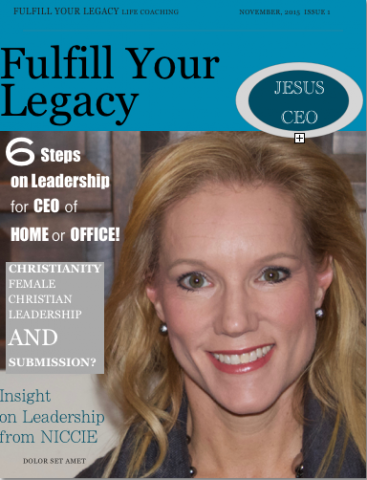 Featured in Fulfill Your Legacy’s February, 2016 issue on Leadership and Christianity. Bringing over 20 years of healthcare leadership experience, I lead teams through goal setting and benchmarking; encouraging and inspiring others is one of the most fulfilling parts of my life. Then one day, this life I loved became mundane. I had to work very hard to keep the passion I once had without trying. I kept getting nudges that I needed to do more and progress on, but I didn’t know what that was or how to proceed. Finally, I turned to my faith for answers. In a one-year span I became certified as a life coach, built a practice focused on health, life, and spiritual coaching with leadership training in the forefront of my passion. And now I have written a book to reach and help even more individuals and organizations. “Awaking the Living Legacy” is a powerful book helping others to gain a life of fulfillment and success. It is packed with tools and insights to awaken you to the legacy God has left for you. A legacy of ownership into his gifts, awareness of your best life, and acceptance of all He offers. This is the Living Legacy. The Legacy Jesus left for you and how to abide in His abundance. 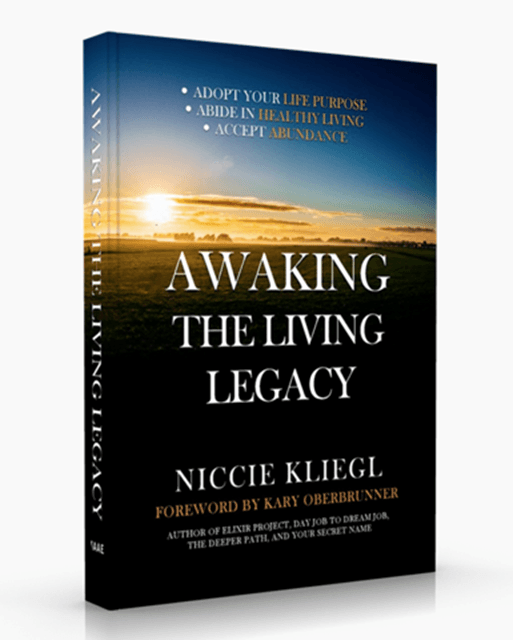 “Awaking the Living Legacy truly depicts Niccie’s heartfelt desire to teach others of the amazing strength, healing, peace, and abundance that waits at the door of those who partner with God. 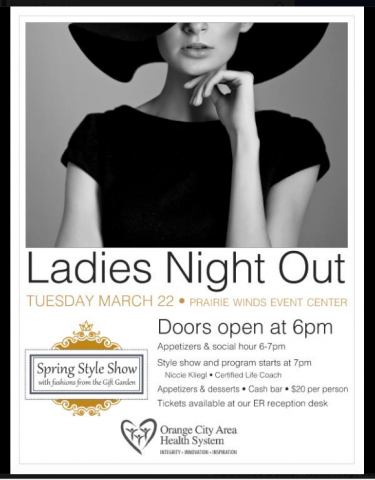 Niccie connects powerfully with large audiences while reaching the audience as if she is meeting with one. 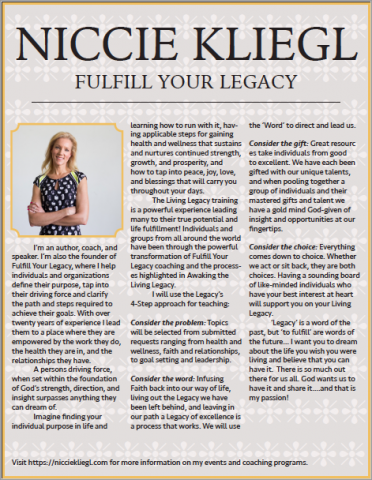 She founded Fulfill Your Legacy, LLC, in 2015 with a mission of infusing faith and the “Word” back into the daily lives of those she comes in contact with. She is a mother of two beautiful daughters and a wife to her loving husband of 25 years, Jeff Kliegl. Our health is deteriorating before our eyes. We are burning at both ends. Doing whatever we can to give to our children, struggling to keep our full-time jobs and balancing a home. We grab “to go food” between activities and rarely sit together to enjoy a meal. It’s hard to keep up this pace and the stress is literally killing us…When do we refuel? With too much stress our mind and body shuts down, which increases stress and leads to a horrible cycle. Page 103: We go-go-go, and while this rat race is on, we prioritize. Sleep is often the place to cut from and this only packs on the pounds and wears us out more. Sunday is often the only day to catch up on sleep and rest. Church is often left out, not by intention but by what they feel is survival. Little by little, piece by piece, the once black and white wisdom, written for all to live in and love by, is getting lost, faded… and buried. Our busy lives are crowding out church with it’s Biblical teaching and the boundaries of good and bad, right and wrong, which are slowly muddying. This distance only carries away our empty souls, making it even harder to fill them up and restore our bones. I talk a lot about the need to be transparent if you want to grow from your mistakes. When looking back at our life we can see how different it would be if we had tried to conceal a particular weakness or what it would have been like if we hadn’t. It’s too hard to keep up “a front” and live as a pretender. I inspire those I work with to be authentic. Having acceptance first is key. This is why owning your place with God is necessary. AND this is how we get to a place where we are gaining and growing regardless of our setbacks. names were listed off for all the school to hear…mine being one of them. They asked us to meet in some room that I was unfamiliar with. At first, I was relieved to be saved by the bell, and then dread set in as I knew something was wrong. As we each filed out of our respective class rooms, I noticed in the hallway one other boy who seemed to be wearing the same cautious expression I was. I rather clung to this boy, and he to me as we were crammed into a very inappropriately small room for us. I listened to the teacher explain that we were in there to get extra help with reading. I believed her. It seemed she genuinely wanted to help us. Some kids laughed and joked, making fun of themselves even, and I hated that. I simply did what I could to keep from tearing up at this chance to learn to read. “Wouldn’t that be great if I would be able to read?” With a hopeful heart, I decided right then and there that I would do whatever they said and I would leave here a reader. We spent the next weeks “reading.” Actually, we spent the next few weeks memorizing our own very simple book. I went from totally committed and hopeful to disillusioned and upset. Some kids had trouble memorizing on top of everything else, and I remember feeling so badly for them. One day the teacher said we would have a gathering with our parents for them to see all we’d learned. I was so confused. Did they think we didn’t all know we couldn’t read…that we learned nothing? Then they had us get up one evening in front of all our parents and “read” our book to the whole group. My mom was smiling so broadly. She was amazed and a part of me wanted to pretend I could read. But the clear-headed part of me knew the truth. THE COST OF NOT WORKING ON YOUR GOALS AND OBSTACLES IS DENYING YOURSELF OF YOUR DREAMS. ARE YOU READY TO GIVE UP ON YOUR HOPES AND DREAMS THAT ARE AWAITING FOR YOU ? I have seen so many individuals grow from fine to just fabulous. Patients gaining their health back after spiraling out of control. I am joyful beyond belief as I watch an employee work through relationship troubles that were embedded within them from years back. It’s like one of those pendulum desk toys. Once it is ignited it cannot stop. Soon they break free from those foot holds and live joyful, and highly effective. I see countless (amazing) women at an age they are ashamed to admit, still searching for their place in this world, having given every piece of themselves to others… no longer even recognize who they are. They too awaken to their unique path, and are glorified in their transformation and fulfillment-as the sink into their God-given place and all His Glory. I am so proud and amazed by these women, for fighting to be partnered with God. I want every person on this earth to lose the world- and gain their soul! Our purpose, our health, our relationships…they are all blessings willed to us as a legacy left behind. What if we gave up before we even knew our God-given purpose and all the blessings it would bring. What if we gave up not realizing, that when partnered with God, even our hurdles, mishaps and set backs are in His hands and our plans. him… and he was failing. He did find the cure, after failing over and over. Without those failed attempts all tossed into the trash, he wouldn’t have been able to witness the true miracle of nature healing itself. He found an amazing cure because he used a door opened to him. Something in him was alert and ready to notice what many would have blown by. He reports that ‘Join-Up’ methods rely on horse and trainer establishing a bond of communication and trust. “You must somehow understand that we as horsemen can do very little to teach the horse. What we can do is to create an environment in which he can learn.” Monty says, “We hear that ‘actions speak louder than words,” …When I am life coaching I do not want my clients to need me or depend on me. I teach faith-infused growth and living, because there is so much value from living within a Christian environment and depending on God. Once we get accustomed to the tools and resources, they will ignite a lifetime of action from our Almighty. I have a passion for inspiring others to gain all they can by joining up with God. The ‘Word’ is their syllabus, the Holy Spirit their guide, and Jesus Christ their Savior. Once they learn to depend and trust in this unbreakable bond, I can hardly hold myself down with joy and gratitude. At this time, they start their journey in the Living Legacy. 2. “Who are the people you serve? 3. What made you consider writing a book? 4. What is your company “Fulfill Your Legacy” about? 5. You make references to secular- how do you do both? 6. Deepening your spirituality quite popular right now. What sets you aside from the rest? 7. How long does a person work with you? 9. How much do seminars and coaching cost? this abundant life of purpose, health, and directions?